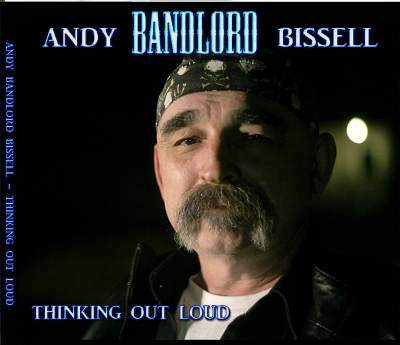 The 2016 release of “Thinking Out Loud” by Andy Bandlord Bissell is a collection of original songs in the, straight ahead blues based rock vein. A collection of 14 songs, 11 of which were penned over the last year and 3 from earlier stages in his career which have been reworked and rearranged. This project was self financed and utilized family members and friends who contributed their time to see this musical venture come to life. Andy tends to write about the daily issues that affect all of our lives and many can relate to the indifference directed at big business & government in general. Andy started singing in bands at the age of 13 back in the 1970’s and had also dabbled with the family’s upright piano learning some standards as well as piano theory. These bands were comprised of local lads from the Corunna, Sarnia, Courtright area of southwestern Ontario and played local schools and bars, with a couple of them, namely, BANDLORD & XCIX, gaining quite the collection of dedicated followers. 1981 saw Andy moving to Toronto to pursue his music career, singing in a few different bands over the next couple of years and recording some demos. These demos and a live performance in Brampton caught the eye of an EMI Records rep, who wanted to get Andy into the studio, without his band, to record with studio musicians. Andy refused to abandon his band-mates in favour of studio musicians, the response was “You have a great powerful bluesy voice, but it’s the wrong style for the current trend of New Wave music”, and therefore recording never happened. Barely earning enough to sustain the necessities of life, no actual address or proper income, Andy moved back to Sarnia in 1984 to find a day job and put music back to weekend hobby band status. With some like minded musicians from the Wyoming and Petrolia areas, a new band was formed and it was back to playing the locale bar circuit for the next two years. In Oct. 1986 Andy had the opportunity to move with his wife to Edmonton Alberta, for a secure well paying job, and so it was. Music became a listening hobby, but Andy took to writing poems. Over the years his family grew and his children’s musical talents became apparent, singing, guitars, keyboards, in fact his one son recorded 2 CD’s with a local Edmonton band in the early 2000’s. Andy started to feel restless and started to fool around with an old Casio keyboard that sat in the basement, it did cause a smile. Yet with his son playing Lead Guitar and singing on CD’s Andy decided to try his hand at guitar and bought a nice new Strat. The musical desire was starting to become stronger again and needed an outlet. in 2011 a new opportunity arose. A friend of his son was recording a project and had heard a few of Andy’s old demo tapes, which caused him to ask Andy to record some harmonies on a track for him. Andy gladly accepted since he hadn’t been inside a recording studio nor belted out a tune for nearly 30 years! The session went so well Andy was asked to sing Lead vocals and edit/rewrite/contribute lyrics for the entire album (Tragedy In Hell by Enforcem – relaesed 2012}. Now this awoke the beast that lay dormant inside! With only a few short years left at his day job to ensure a pension, Andy started to think out retirement plans and how music could once again be a focus in his life. By the end of 2014 he had purchased an Tascam 8 track studio recorder, an 88 key Korg Kross keyboard, studio microphones, cables, stands and he practiced and wrote down ideas and practiced that keyboard until it became familiar again. The intent at the time was to revisit a bunch of original tunes he had co-written in his heyday of the late 70’s and early 80’s and get them on a CD, but after listening to the numerous tapes from all those years ago he realized how “dated” they sounded. Inspiration arose, the issues of the mid 2010’s came to mind, ideas flowed, so many up to date thoughts. What was burning on Andy’s mind these last 3 decades? It wasn’t boy meets girl, boy lost girl, it was more mature ideas, a happily married man for 30 years this line of thought didn’t really exist anymore. No, it was our greedy banking system, our twisted insurance empires, our conniving governments, corporate bullies, it gave so many opportunities to write about today’s concerns, and so it began. 11 New songs written in just under a year, plus 3 songs from the past rearranged. One of these retooled tunes entitled Another Drink wasn’t as dated as many, it dealt with a subject matter that is endless, denial. It was brought down a bit from the original 80’s version, not quite as heavy and a bit more melancholy. I Need To Smile, from 1983 was about the benefits of collecting unemployment, but has been updated to deal with the joy of retirement, a short rockin’ high energy tune. Lastly of the three older tunes, Not For Me, an old school style rock song, that was include because of the pressure bestowed upon me by my children because they always loved this song. I told them, it’s dated, they responded, it’s classic you have to do it, so it has been included and is true to the original version. All the new songs are dealing with the aforementioned banks, government, insurance companies, big business, greed, with a poke at modern Pop Stars, a stab at the daily work routine, bad days, encouragement, and a wee bit of boy girl stuff, only more grown up.